Property rights are gradually replacing prescriptive regulations for managing commercial fisheries. Many commercially important fish populations are now managed by establishing rights for fishers to harvest specific quantities of various species and allowing these rights to be traded in markets. But could these same principles be used for non-target species? Recent evidence suggests that the answer may be yes. In principle, this approach can also be used to limit incidental catches (also known as “bycatch”) of species that have little commercial value but are protected due to their ecological importance. This PERC Policy Series, authored by economists Steve Miller and Robert Deacon, examines a recent application of this strategy for managing bycatch in the U.S. West Coast groundfish fishery and describes how fishers responded to this innovation by adjusting their fishing methods to avoid overfished species. These adjustments occurred along several margins, including changes in fishing locations, gear used, time of day fished, and duration of fishing episodes (trawl tows)—all of which are consistent with the avoidance of protected species. The observed responses were subtle and nuanced, suggesting that achieving conservation goals at minimum cost can require behavioral adjustments that would be difficult or impossible to achieve with command-and-control regulation. Four decades ago, the dominant paradigm used to manage fisheries began to shift. Command-and-control regulation was the default approach at the time. Government managers attempted to control the total catch in a given fishery by prescribing fishing methods, open seasons, spatial closures, and the attributes of fishing boats and gear. The new paradigm called for hard limits on the total catch but, by contrast, allowed market forces to determine the details of where, when, and how fish are caught. To implement this approach, managers assigned quantitative catch rights to individual fishers. 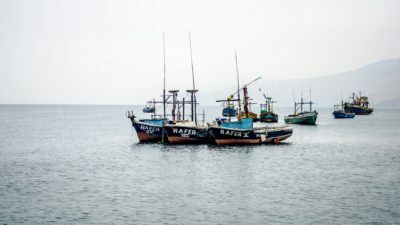 This market-based system, which created clearly defined property rights to a total allowable catch, has improved the economic outcomes of fishers as well as the biological condition of fish stocks. Two caveats, however, should be noted. 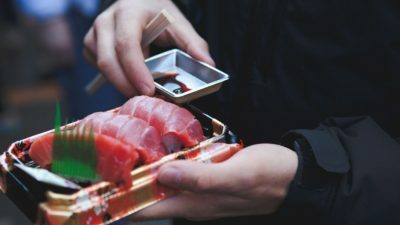 First, this paradigm shift has progressed slowly; as of 2012, fish caught under market-based management amounted to roughly one-fourth of the worldwide catch. Second, the new paradigm often attenuates market forces; regulators fix the total catch, market trades are commonly restricted, regulators may still prescribe spatial closures and other limits, and government managers may revoke catch rights. Nevertheless, where this type of market-based management has been implemented, it has achieved impressive economic and biological gains. Fishery management has traditionally focused on managing the species that are most profitable to catch, or what are called “target species.” Although fishers focus their efforts on target species, fishing is an imprecise process, and other species often are caught incidentally. This phenomenon, called “bycatch,” is an increasingly important management concern. It is especially problematic when bycatch species play important roles in ecosystems and when the stocks involved are precariously low. The typical management fix is to impose command-and-control regulations such as spatial closures, limits on fishing methods, and, in extreme cases, the closure of entire fisheries. The bycatch problem can in principle be managed using the same market-based approach that has been successfully applied to target species. Fishery managers could set total catch limits for each bycatch species based on biological considerations and then assign tradable shares of these overall limits to individual fishers. The profit motive would then incentivize fishers to find the least-cost methods to limit bycatch—a motivation that is largely absent under the current management system. While sensible in theory, market-based approaches to managing bycatch are seldom implemented, and evidence comparing such a system to typical rule-based bycatch management is scarce. A recent policy shift in a large U.S. fishery away from command-and-control and toward market-based management provides an opportunity to compare the two approaches. 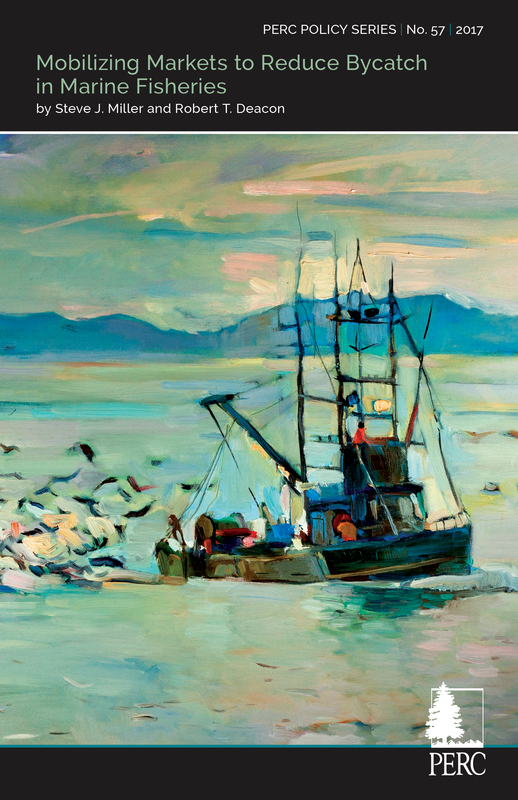 In 2011, the U.S. West Coast groundfish fishery transitioned to a management system in which both target and bycatch species are managed by assigning quantitative catch rights to individual fishers. In this PERC Policy Series, we demonstrate how incentives differ under the two systems and document how the policy shift affected fishing methods. We begin by describing the fishery, its regulatory history, and its economic performance. We then describe the shift to market-based management and identify changes in fishing practices associated with the new policy. We find that fishers adapted by changing the ways they fished—for example, by shifting fishing locations, switching to different gear, and changing the timing and duration of fishing. The overall behavioral responses were fine-tuned, subtle adaptations that would be difficult or impossible to achieve with prescriptive regulations. We also find that the policy objective succeeded: Bycatch declined after the new management system was put in place. Before examining the case study, a fundamental point deserves emphasis: The economic and biological failures that have plagued fisheries around the world result from the absence of exclusive property rights and are not due to inherent attributes of the resources. Without exclusive property rights to fish stocks, which are potentially valuable assets, the contracts and market transactions that could in principle lead to efficient resource use will not emerge, and open-access competition will dissipate returns. Exclusive rights may be missing because fish stocks are usually hidden and are often mobile, which makes monitoring and enforcement difficult, or because legal institutions do not assign exclusive access rights to any particular party. Absent property rights, the resource is vulnerable to the well-known tragedy of the commons. “Groundfish” is a generic term for species living on or near the seafloor, including Dover and Petrale sole, black cod, and a variety of rockfish. In the case of the U.S. West Coast groundfish fishery, most of the effort is directed at a few high-value populations of groundfish, but the entire harvest includes more than 40 individual species and species groups. The spatial extent of this fishery is the western coast of California, Oregon, and Washington. Most of the catch is made by trawling, during which a fishing vessel tows a bag-shaped net through the water, catching most of the fish in its path. By its nature, trawling is not highly selective, and a variety of non-target species may be caught in a single haul of the net. Commercial fishing in this fishery began before World War II, carried out mainly by non-American fishers. U.S.-based fishing rose in prominence after 1970, following the initiation of federal policies favorable to American fishers. The passage of the Magnuson-Stevens Act in 1976 was a regulatory milestone. This act established regional commissions to manage fishing in U.S. territorial waters, and, with amendments, it remains the centerpiece of federal management to this day. Another milestone was the establishment of 200-mile exclusive economic zones a few years later. With these institutions in place, U.S.-based vessels came to dominate harvests in this fishery. Between the mid 1970s and early 1980s, the American harvest of groundfish roughly doubled. After groundfish harvests peaked in the early 1980s, federal regulators adopted a fishery management plan to control catches. This plan, along with subsequent measures adopted throughout the decade, shortened fishing seasons, restricted fishing gear, and placed caps on the amount of bycatch allowed in the fishery. In the subsequent decade, the Pacific Fishery Management Council, the key management agency for West Coast groundfish, stopped issuing new permits for most of the fishery, effectively closing entry to new fishers. Despite these efforts, groundfish stocks, catches, and fishing incomes declined throughout most of the 1980s and 1990s. In 2000, the federal government declared the fishery an economic disaster. A few years later, managers began buying back fishing permits in an attempt to reduce fishing activity and thereby boost groundfish populations. Stocks failed to rebound, however, prompting managers to impose increasingly stringent rules, such as limits on each fisher’s catch of various species. These rules, known as “trip limits,” constrained a single vessel’s catch of individual target and non-target species during a certain block of time, usually a two-month window. Each fisher faced species-specific trip limits for more than 20 species; trip limits also varied by location, month of year, and type of trawl gear used. The rationale was sensible: Trip limits were intended to mitigate the destructive “race to fish” that can arise from a policy in which a fishery is formally closed only when an aggregate catch target is met. The race to fish refers to the incentive each fisher has to harvest before catches from the entire fleet cause regulators to close the fishery. While arguably an improvement over a simple season-closure policy, trip limits led to economic and biological waste, given that the West Coast groundfish fishery contains numerous species yet trawling is a relatively non-selective method of fishing. For example, if a vessel exhausted its trip limit for black cod, but not for sole or rockfish, any additional catches of black cod might be tossed overboard. This clearly was economically wasteful, and it could also be biologically destructive because discarded fish often do not survive. Fishers who were sensitive to the potential wastefulness of discarding might cease fishing entirely once they reached the trip limit for a single species, even if their catches of other species were below the allowed limits. The bycatch problem associated with trawling became increasingly prominent in the 1990s and beyond. Between 1999 and 2002 regulators identified nine groundfish populations as “overfished species,” and a 10th population was added in 2010. Overfished species is a regulatory term for populations that have been reduced to precarious levels and, for that reason, have been subjected to special management rules. While some overfished species, such as Petrale sole, have been targeted by fishers at various times, most are taken as incidental bycatch by fishers who are targeting other species. A variety of prescriptive fishing regulations were implemented to rebuild these stocks. One set of policies involved closing areas to trawl fishing or limiting how and when trawling was allowed. The boundaries of these areas were shifted from year to year, or even within a single season, to adjust to new information about conditions in the fishery. Additionally, regulators adjusted harvest caps for certain target species that were found in the same habitats as vulnerable bycatch species. Finally, harvests of sensitive bycatch species were capped for the entire fishery. If the cap for a single overfished species was violated, the entire fishery, including all target stocks, could be closed. Since these caps applied to the aggregate catch, individual fishers had little incentive to minimize bycatch. In 2011, the West Coast groundfish fishery transitioned to a rights-based management scheme known as individual fishing quotas (IFQs). Rights to harvest specific amounts of each species were created, with the total number issued for any species determined by biological considerations. 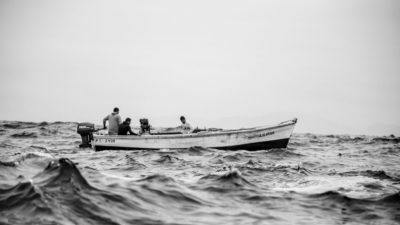 These rights were then distributed among active fishers in the form of quotas that roughly corresponded to each fisher’s historic annual harvests. IFQ rights were distributed at no cost to the fishers, with allocations renewed annually. Under the IFQ system, at the start of every year, each permit holder owns a portfolio of harvest rights for all species. Fishers are required to hold sufficient rights to cover the amount of each species of fish caught that year or obtain rights from someone else if they catch more than their allotted amount. Fishers who do not have sufficient rights to cover their catch for any species must, after a 30-day grace period, cease fishing for the remainder of the year. The IFQ rights in the West Coast groundfish fishery—both for target and overfished species—command positive prices due to their limited supply. These quota prices penalize individual fishers for harvesting overfished species. For a fisher whose quota holdings of overfished species fall short of their actual catch of such species, harvesting an extra pound of overfished species requires buying an equivalent amount of quota from someone else at a price that exceeds what the landed fish are worth. For a fisher who has a sufficient quota, catching an additional pound of overfished species eliminates the possibility of selling the corresponding quota to another fisher. In either case, the fisher faces a penalty for catches of overfished species, and this penalty creates an individual incentive for fishers to avoid harvesting overfished species, an aspect that was missing from earlier regulations. This penalty, however, also creates another problem: It possibly encourages fishers to discard their catches of overfished species. Anticipating this problem, regulators required on-board monitoring for all trawl trips, and they debit a fisher’s discards against the fisher’s quota allocation. Monitoring is carried out by third-party contractors who must be certified by the management agency. Shortly after the IFQs were created, trading of quotas for target and bycatch species began through an online auction market, brokers, and on a peer-to-peer basis. Summary information on average quota prices for overfished species and on typical overfished-species quota allocations indicates that the new management regime dramatically changed the incentives of fishers to reduce bycatch. First, all overfished-species quota commanded positive prices, and in some cases these prices far exceeded what the fish would sell for at the dock. Yelloweye rockfish topped the list, with quota prices of $19 to $30 per pound in 2011-12, while its price at the dock was roughly $0.30 per pound. Canary rockfish, another overfished species, also stands out, with quota prices of $1.60 to $2.07 per pound in 2011-12 and a sale price of $0.54 per pound. Second, many fishers had small allocations of overfished-species quota, so the risk of being forced to acquire additional costly quota from the market was very real. Yelloweye rockfish is again an extreme example: One-sixth of fishers in the fleet had zero allocation for this species, and the average allocation in 2011 was just 7 pounds for the entire year. 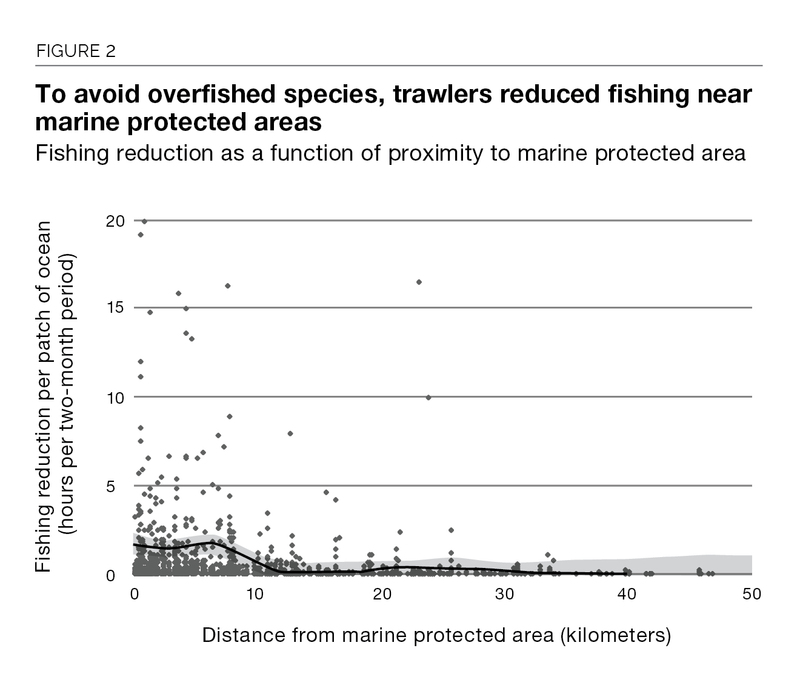 Clearly, individual fishers had strong incentives to avoid harvesting overfished species. While trawlers clearly had an incentive to avoid catches of overfished species under the new regime, one might expect the blunt technology of trawling to render the mix of species caught relatively fixed. After all, a trawl net is towed far below the surface, scoops up most fish in its path, and is usually towed for several hours before it is retrieved. 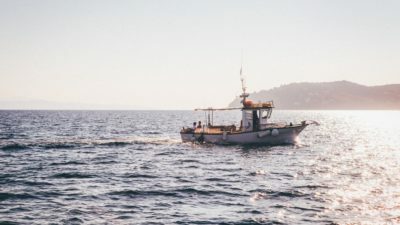 After the introduction of market-based management policies, however, West Coast trawlers were in fact able to control the mix of species caught once they were given clear economic incentives to avoid catches of overfished species. One straightforward response observed was a reduction of fishing in areas where catches of overfished species are common. But trawlers also made more subtle adjustments. Some shifted fishing activity from day to night, taking advantage of the fact that some overfished species migrate up from the seafloor and out of the way of trawl gear at night, while certain target species do not. Some trawlers also shortened the duration of trawl tows, a practice that provides more precise information about the mix of species being encountered as trawling proceeds. An obvious strategy for avoiding catches of overfished species is to shift away from trawling and toward more selective gear such as traps and hook-and-line assemblies, which is precisely what some fishers did. Additionally, some trawlers formed associations and began sharing information about where overfished species were likely to be concentrated. Overall, fishers made nuanced adjustments on several margins. This occurred naturally and without prescriptive rules once harvest rights were created and a market had emerged. Summary data indicate that these adjustments had the effect policymakers desired. The fraction of overfished species in trawl landings in the West Coast groundfish fishery approximately halved after IFQs were introduced, as seen in Figure 1, indicating that fishers’ trawl selectivity improved. The improved trawl selectivity, combined with a shift toward fixed gear, caused trawl catches of overfished species to fall dramatically during the first two years of the new management regime. Fishers in the West Coast groundfish fishery responded to incentives to reduce overfished-species catches in many nuanced ways. Logbook entries, required for every trawl tow in the fishery, provide reams of evidence about how fishers altered their actions. The logbook data give us a detailed window into how fishers avoided overfished species in response to the implementation of the market-based management policy. In recent research, we empirically analyze these spatial shifts by examining trawl activity across patches of ocean roughly 10 miles wide (east-west) by 15 miles long (north-south). Further spatial delineations were defined to account for regions that regulators have closed to trawlers. To examine whether fishers’ locational shifts are consistent with bycatch avoidance, we needed a proxy for expected catches at each location; we used catches over a previous period for this comparison. Our empirical analysis also required data on additional variables, including prices for landed fish, fuel prices, wage rates, and cost per hour spent towing a trawl net. The decision to fish at a certain location is presumably driven by expected profit, and thus depends on multiple factors such as the expected catch at that location, the cost of applying effort there, and fish prices for relevant species. When IFQs were introduced in 2011, the profit calculus changed. The prices of IFQs for target and overfished species became additional costs. Regarding overfished species, we consider whether IFQs would incentivize fishers to move effort away from locations that hold high concentrations of these species. The rationale is obvious for the fisher who has an insufficient quota for the quantity caught, since they must purchase additional quota from someone else, which reduces their net revenue. It is also valid for the fisher who has a surplus of quota, because catching an extra unit of fish requires them to use an equivalent portion of their quota that otherwise could have been sold. Data on IFQ prices for each species would allow us to determine whether fishing declined at locations where expected quota costs (IFQ price multiplied by expected catch per hour spent towing the trawl net) are high due to the policy innovation. Although an online auction emerged shortly after IFQs were introduced, and some prices from this market are reported, these price data are far from complete and are possibly non-random; we do not use them for these reasons. Instead, we investigate fishers’ movements by examining their willingness to incur additional travel costs, or reduce their catch of target fish per hour spent fishing, to avoid concentrations of overfished species. Prior to the IFQ innovation, a particular location would attract fishing if the expected revenue from the target species catch minus the cost of fishing was relatively high. When IFQs were implemented, that location could have lost fishing activity if its expected catch of overfished species, and the corresponding IFQ prices, were high. With this reasoning, we can see whether there were IFQ-induced shifts in the relationship between fishing at each location and each location’s access cost, expected fishing success, and fish prices. Formalizing this intuition in a model enables us to impute an IFQ price for each species. Our estimates indicate that fishers did indeed shift away from areas with high concentrations of overfished species after IFQs were introduced. Our analysis also implies per pound penalties for overfished-species catches that range from $0.83 to $21.17, depending on the species. These are in the same ballpark as quota prices on the auction market. One observed pattern of spatial avoidance is particularly striking. The pre-IFQ regime relied on spatial restrictions to protect areas where concentrations of overfished species are high. Inside these “marine protected areas” (MPAs), trawling was either prohibited or restricted in some fashion. Given their protected status, target-species stocks tend to be high inside MPAs and in areas adjacent to MPAs. 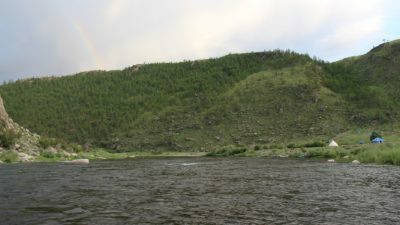 In the pre-IFQ period, it was therefore attractive to fish just outside the boundary of an MPA. Fishers who did this were in compliance with regulations regardless of how high their catches of overfished species were, and target species tended to be abundant just outside MPA boundaries. These spatial restrictions remained in place after IFQ implementation, but trawlers’ behavior toward fishing near them changed. With IFQs in place for targeted and overfished species, fishing along an MPA boundary became decidedly unattractive because overfished species are also abundant at these locations, and the IFQ system resulted in high costs for catches of overfished species. Empirically, we find that fishers moved away from MPA boundaries when IFQs were introduced, effectively creating areas of voluntary partial closure that extended beyond the official boundaries of MPAs. We establish this conclusion by estimating the spatial shifts in fishing that can be attributed to bycatch avoidance in the post-IFQ period and then plotting these reductions against distance to the closest MPA. The resulting pattern shows up clearly in Figure 2: Fishing reductions were greatest near MPA boundaries. In effect, the IFQ system caused a voluntary expansion of the existing system of marine protected areas. The particular behaviors of target and overfished species provide opportunities for trawl fishers to select target species more precisely, and we find that fishers exploited these opportunities once IFQs effectively levied prices for overfished-species catches. Target and overfished species in the West Coast fishery are generally bottom dwellers, but some overfished species move upward from the seafloor at night, while important flatfish target species such as Dover sole do not. This behavior allows fishers to avoid catching these overfished species without foregoing harvests of target species if they fish at night. We performed a test of the distributions of trawl fishing starting times in pre- and post-IFQ periods and found a significant difference that runs in the predicted direction: Trawl fishers increased night fishing after IFQs were introduced. If this difference is attributable to avoidance of overfished species, then the shift should be most pronounced for locations where concentrations of overfished species are high. Empirically, we can see this effect clearly for the most critical overfished species: yelloweye rockfish. Trawlers can also adjust the mix of overfished and target species by hauling their nets up on deck more frequently. While a net is being towed, the skipper does not know the composition of his catch and would be unaware if a high concentration of overfished species was being encountered. Catching a high proportion of overfished species imposed no direct penalty on an individual skipper in the pre-IFQ period but carried a potentially high cost after IFQs were in place. Consequently, the value of information on the species composition of the catch rose dramatically after IFQ implementation. The natural way to get more frequent information on the composition of a catch is to haul the net in more frequently, resulting in shorter trawl tows. Furthermore, a fisher might choose to make shorter tows as a way to learn about the locations of stock concentrations of overfished species and areas to visit or avoid on future trips. We would expect, therefore, that the duration of trawl tows declined after adoption of IFQs and that this effect would be most pronounced in locations where the composition of the catch is uncertain. A comparison of pre- and post-IFQ trawl durations confirms that trawl tows did indeed become shorter. To sharpen our analysis, we controlled for possibly confounding factors such as ocean depth and, importantly, we modified the test to see whether reductions in tow duration were most pronounced in locations where concentrations of overfished species are most uncertain. Uncertainty over concentrations of overfished species was indicated by variability in the proportion of overfished species in catches for prior years. This more detailed statistical test supports the idea that the IFQ policy change prompted fishers to avoid overfished species: Tows became shorter in locations where the share of overfished species in catches was highly uncertain relative to areas of more certainty. This pattern was not present in the pre-IFQ period. We also found that fishers with extensive experience on a given patch of ocean in prior years made longer tows under IFQs compared to less experienced fishers. If these adjustments were motivated by the IFQ policy, we would expect to see the overfished-species portion of trawl catches decline substantially after these adjustments in fishing methods were put in place—and this is exactly what happened. 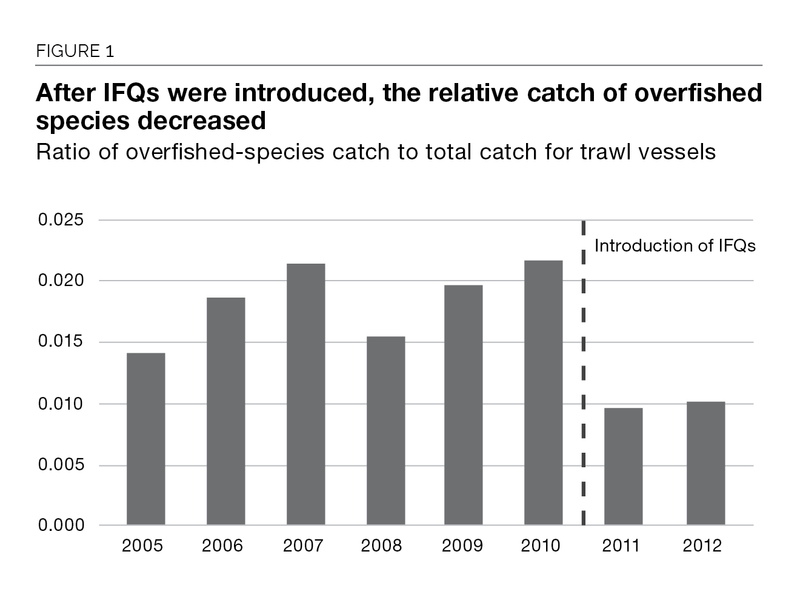 As displayed in Figure 1, in the first two years of IFQ management, the percentage of overfished species in the total trawl catch fell by nearly 50 percent compared to the preceding five years. In particular, trawl catches of yelloweye rockfish and cowcod, two critical overfished species, fell by 90 percent and 95 percent, respectively. Beyond adjusting trawl techniques, fishers can also select target stocks more precisely by using fixed gear such as baited hook-and-line assemblies and baited fish traps and pots. The superior selectivity of fixed gear is evident from data covering 2010, the year just prior to IFQ implementation. During this year the ratio of target catch to overfished-species catch was roughly seven times greater for fixed gear than it was for trawl gear. The IFQ program improved the economic attractiveness of fixed gear. Accordingly, and after controlling for possibly confounding factors, including relaxation of a regulatory constraint on changing gear, we find that the catch shifted toward fixed gear after IFQ adoption and, critically, the shift was most prominent in locations and seasons where overfished-species catches had been most problematic during the pre-IFQ period. This effect is both empirically large and statistically significant. Creating property rights to a share of the total allowable catch is now a well-established principle for managing target stocks of commercially valuable fish that harvesters seek to catch. Our analysis demonstrates that this approach can also control incidental harvests of species that are not commercial targets but are valuable nonetheless due to the important roles they play in ecosystems. This method of creating property rights for the purpose of avoiding undesirable bycatch is analogous to using property rights to control another socially undesirable phenomenon: air pollution. Cap-and-trade policies for pollution control—such as the U.S. sulfur dioxide trading program created by the Clean Air Act Amendments of 1990—are analogous to the IFQ approach for limiting bycatch in marine fisheries, and the efficiency advantages that result from aligning individual incentives with the social goal of cost minimization are similar for both applications. The practical difficulty and informational requirements of using command-and-control regulation to achieve conservation goals cannot be overemphasized. The application examined in this paper, commercial fishing, is a complex, information-poor, joint-production activity. The biological resource is multi dimensional, dynamic, and unobservable to the fishers who seek to exploit it. Conservation targets, in the form of aggregate bycatch limits for various species, represent a set of constraints that correspond to social goals. Satisfying these constraints at minimum cost with command-and-control regulation—by prescribing exactly how individual harvesters interact with the resource—would require information that is time- and place-specific and knowledge that is dispersed among resource users and unavailable to any central manager. The West Coast groundfish fishery sought to satisfy conservation goals in the pre-IFQ era by restricting gear, closing areas, and imposing other constraints, but these rules did not motivate fishers to use the dispersed information available to them in ways that would minimize the social costs of overfished species conservation. Instead, the primary incentive was to comply with regulations in order to continue fishing. Creating property rights to the harvest of the resource in the form of IFQs gave individual fishers incentives to use their dispersed knowledge to find least-cost solutions. Creating property rights in the West Coast groundfish fishery also incentivized fishers to take collective action. One example was due to a new source of risk that accompanied the creation of IFQs for bycatch species. The catch of overfished species on any given haul is uncertain, and IFQ prices for some bycatch species are substantial. Accordingly, each fisher faced possible financial ruin if they made an accidental haul of large quantities of overfished species, and this possibility led to a demand for insurance that would spread this risk. During the first year of IFQ operation, three groups of West Coast groundfish fishers collaborated to form mutual insurance organizations, called “risk pools.” Fishers who join a risk pool place their overfished-species quota under the pool’s management, and the pool insures its members against accidental hauls of overfished species. An individual must fish according to “clean” fishing rules developed by the pool in order to be eligible for coverage. The effect of these market-based management actions on the bycatch populations of interest has been clear and encouraging. As discussed, bycatch declined both overall and as a fraction of trawl catch under IFQs. Those changes coincided with improvements in the overall abundance of several overfished species: Widow rockfish, canary rockfish, and Petrale sole had all been declared rebuilt by 2015. Further, the National Oceanic and Atmospheric Administration anticipates the darkblotched rockfish and bocaccio populations will soon be rebuilt as well. At that point, the 10 species originally identified as overfished would be reduced to just three. An abiding concern with IFQ management in general is that it may cause fishing activity to leave traditional fishing communities and become concentrated at only a few ports and among a few large harvesters. Fleet consolidation is a concern for small coastal communities that have their cultural identities and tourism industries linked to commercial fishing. One such community, Morro Bay, California, and a conservation group, the Nature Conservancy, collaborated with local fishermen to craft a contractual response to this concern. The result was formation of a new non-profit entity, the Morro Bay Community Quota Fund. The fund acquired target and overfished-species quota from the Nature Conservancy, and now leases this quota to commercial fishers who agree to deliver their catch to local processors and to use fishing practices that reflect conservation objectives. Certain caveats of our analysis merit mention. First, our finding that fishers reduced catches of overfished species by making nuanced adjustments does not necessarily mean that all marine conservation problems can be solved by adopting bycatch IFQs. If there are reasons other than bycatch to reduce fishing in specific areas—for instance, to protect spawning grounds or sensitive seafloor features—then spatial fishing restrictions, possibly layered onto bycatch IFQs, may be appropriate. Second, as with any quota-based approach, the effects of bycatch IFQs depend upon the overall quotas determined by fishery managers; quotas set using outdated or inaccurate information will yield suboptimal results. Third, we have presented no evidence on the relative management costs of implementing market-based or command-and-control systems. While IFQs allow fishers to choose the least-cost way of complying with quotas, the costs of monitoring and enforcement under each management regime should also be weighed by policymakers. Moreover, if fishers bear some of the monitoring costs, as they now do in the West Coast groundfish fishery, such costs can create barriers to entry for smaller fishing operations. It is also worth noting that some of the adaptations we documented may be due in part to increased monitoring under IFQs rather than the market-based incentives alone. Finally, the allocation of bycatch quotas redistributes fishery rents, both within a fleet and between harvesters and processors. Such redistribution concerns may influence quota choices or policy longevity through political economy considerations, and for this reason it deserves careful study when formulating policy. Notwithstanding these points, the experience of the West Coast groundfish fishery is relevant for management choices elsewhere. The behavioral adjustments to introducing IFQs on overfished species were both nuanced and highly effective in reducing catches of overfished species. This suggests that bycatch problems in fisheries under command-and-control management may be largely matters of incentives rather than purely technological issues. While trawling is typically considered to be a non-selective technology, trawlers clearly can adjust their fishing methods to alter the mix of species they catch and even minimize their incidental catches of non-target species. The key is to employ a management approach that gives fishers incentives to take such actions, and the evidence presented in this paper suggests that a system based on clearly defined property rights and markets has the potential to do just that. 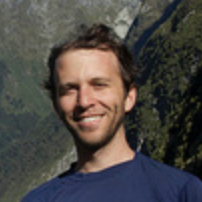 Steve J. Miller is an Assistant Professor in the Department of Applied Economics at the University of Minnesota. His research concerns natural resource and environmental economics and uses both theoretical and empirical approaches to study responses of firms to both environmental policy and uncertainty. Miller’s research focuses include fisheries, induced innovation, and renewable energy.